High quality felt bottom adjustable leveler feet protects your floor surfaces while providing you the ability to adjust leg height to fix wobbly or uneven legs on chairs or furniture. Eliminate the wobble and protect your floor with a quiet sliding felt foot. Adjustable legs help when the floor is unlevel or sloping, you can adjust the furniture to sit level on uneven floors. Threads on the screw are 1/4-20 and can possibly be used as replacement feet in furniture since many manufacturers use that thread size. However, if your existing thread is different or if there is no hole in the furniture then we include a 1/4-20 tee prong nut that can be inserted into wood to create the proper screw hole. Use a 5/16" drill bit and drill a one inch deep hole into wood then tap the nee nut into place. Before drilling, place a piece of tape on your drill bit the same depth as the threads on the adjustable foot so you know how deep to drill. Protect your wood, tile and linoleum floors with felt glider pads. Perfect adjustable felt glides for chairs, tables, foot stools, ottomans, bar stools, dressers, cabinets, entertainment centers and many other pieces of furniture. The felt is gray colored which hides dust, dirt and pet fur. Felt Glides for Wood Floors with One Inch Diameter Felt Pads - thick gray felt pad is 1/4 inch thick and a full one inch in diameter. Felt levelers are made of a durable high density felt - built to last. Furniture Leveler Feet set includes 8 adjustable feet and 8 tee prong nuts with installation instructions. 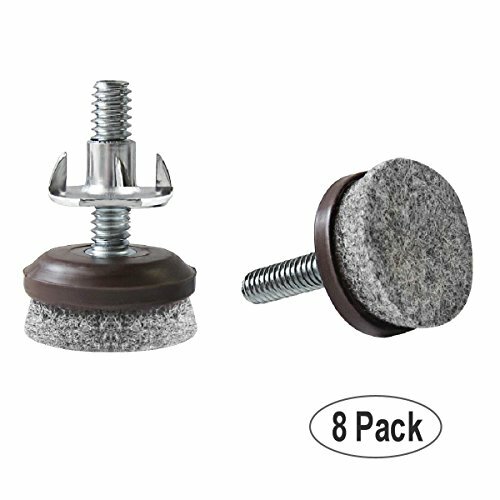 This threaded felt pad can be used as replacement feet or install in wood furniture leg by drilling a 5/16 inch hole and inserting tee nut. If you have any questions about this product by Cloverdale Supply, contact us by completing and submitting the form below. If you are looking for a specif part number, please include it with your message.